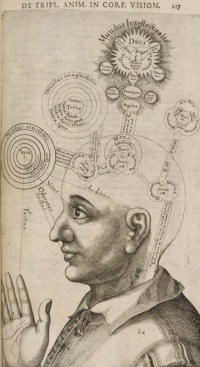 Phrenology (from Greek: φρήν, phrēn, "mind"; and λόγος, logos, "knowledge") is a theory which claims to be able to determine character, personality traits, and criminality on the basis of the shape of the head (reading "bumps"). Developed by German physician Franz Joseph Gall around 1800, it was very popular in the 19th century. In 1843, Magendie referred to phrenology as "a pseudo-science of the present day" Phrenology thinking was, however, influential in 19th century psychiatry and modern neuroscience. Phrenologists believed that the brain is the organ of the mind and that certain brain areas have localized, specific functions (see in particular, Brodmann's areas) or modules (see modularity of mind). Its principles were that the brain is the organ of the mind, and that mind has a set of different mental faculties, each particular faculty being represented in a different part or organ of the brain. These areas were said to be proportional to a given individual's propensities and importance of a mental faculty, and the overlying skull bone to reflect these differences. Phrenology, which focuses on personality and character, is to be distinguished from craniometry, which is the study of skull size, weight and shape, and physiognomy, the study of facial features. However, these fields have all claimed the ability to predict traits or intelligence. They were once intensively practised in anthropology/ethnology and sometimes utilized to "scientifically" justify racism. While some principles of phrenology are well-established today, the basic premise that personality is determined by skull shape is considered to be false. Unless indicated otherwise, the text in this article is either based on Wikipedia article "Phrenology" or another language Wikipedia page thereof used under the terms of the GNU Free Documentation License; or on original research by Jahsonic and friends. See Art and Popular Culture's copyright notice. This page was last modified 07:08, 20 May 2013.